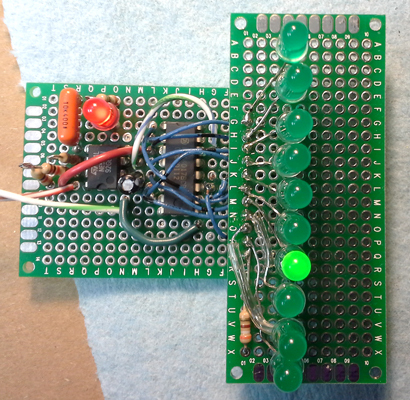 I placed a red LED to show the clock pulse from the 555, and the 10 LED's show the stepped decade output of the 4017B. The 555/4017 main board and the top and bottom of the decade display board. 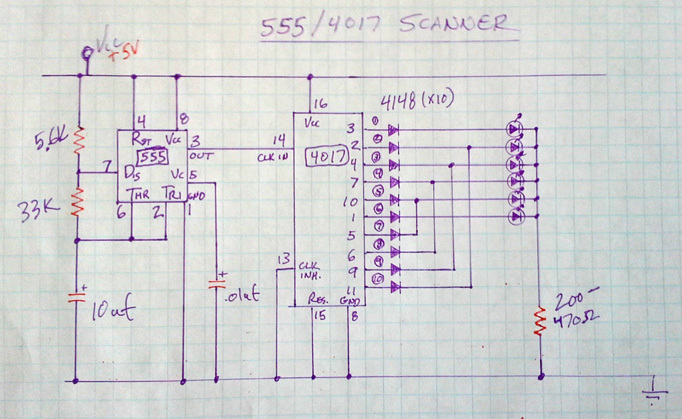 My schematic of the 555/4017B scanner. 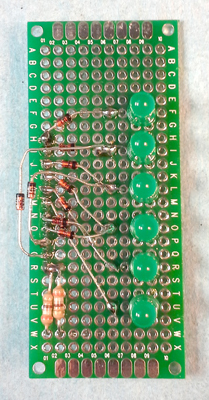 The current limiting resistor on the far lower right should be adjusted to the current requirements of the type of LED that is used. 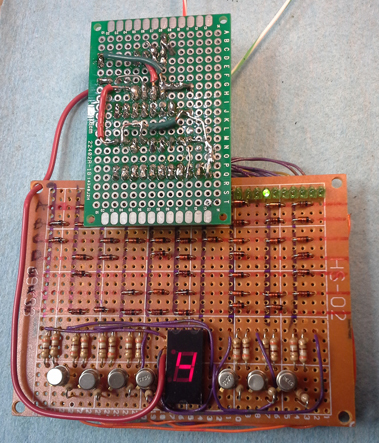 I am using early 1980's vintage HP greens which require a fairly high current to operate at nominal brightness, so in my version I use a 390 ohm current limiting resistor for the decade display board, and 200 ohms for the scanner display board. Top and bottom of the scanner display board. 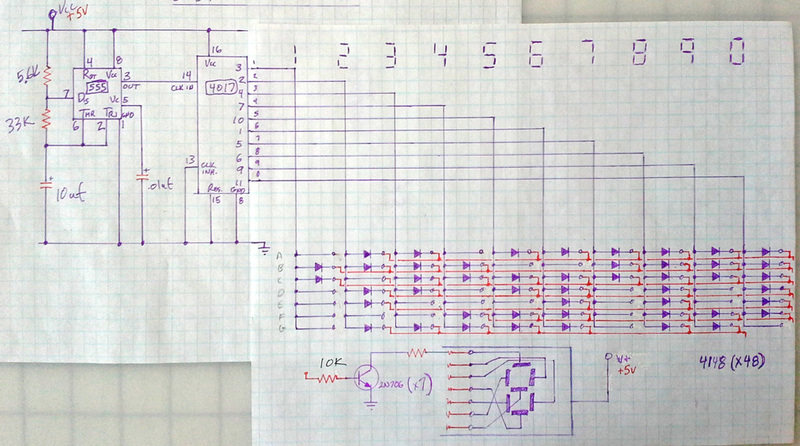 My schematic of the DTL 7-segment encoder with its diode matrix as an extension of the 4017 decade output. The columns represent the digits, and the rows represent the segments. Intersections between the two are created with steering diodes that turn on the appropriate segments based on the digit that is to be represented. A set of 7 vintage RCA 2N706 NPN bi-polar transistor drivers are used to illuminate each individual segment in a vintage common anode MAN-72 7-segment LED display (date coded June 1976). These drivers were necessary because each segment of the MAN-72 requires about 17ma of current for nominal brightness. 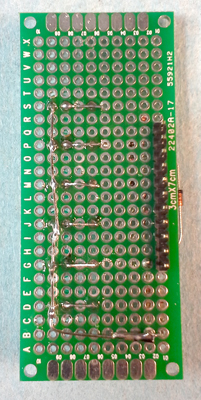 My completed 7-segment driver board. I placed a set of 10 LED's on the upper right to indicate the digit output from the 4017, as it corresponds to the numerical 7-segment display. 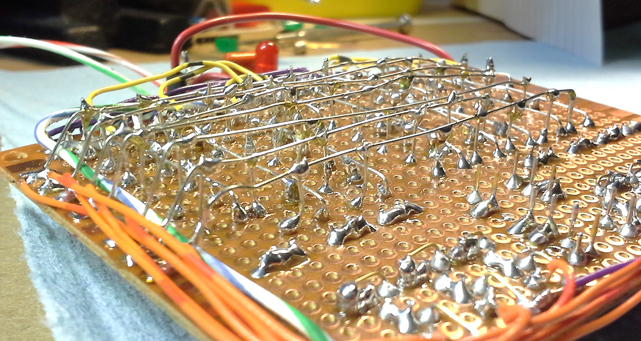 Close up of the underside of the diode matrix... carefully assembled. In strict accordance with Smithsonian rules for photography I had to use a combination of my smartphone, portable audio recorder (for sync sound) and digital camera to document my visit to the National Air and Space Museum over the summer. I had to get really creative in putting this vlog together! Lots of post production was needed to present this in an entertaining format. In addition to a teaser about my Apollo DSKY display research project, which was the reason for my visit, I also take a brief technical tour of the Air and Space Museum. I wanted to examine this collection of historic machines that are seen by millions of people every year in a slightly different way, by detailing some of the technology close up that was involved in these priceless Space artifacts. My many thanks to the generous hospitality and patience of the NASM staff and curators! I did not shoot this footage myself but thanks to my fellow Fixers Leah and Ben for doing the camera work and getting some of the day's activities documented to share. 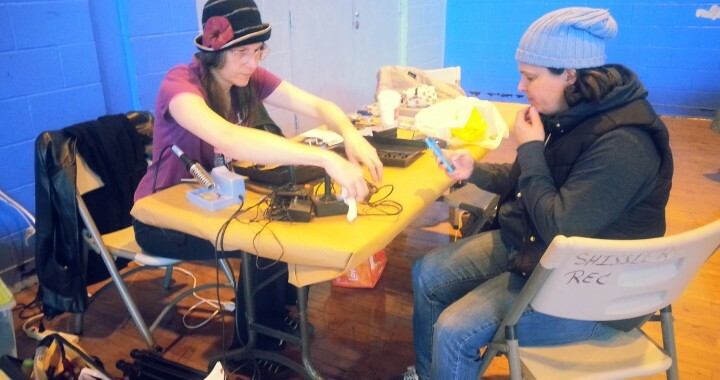 Here is a look into some of the work I did over four hours at the Philly Fixers Guild Repair Fair at the Shissler Rec Center in Fishtown, Philadelphia on November 22, 2014. The philosophy of the Fixer's Guild is to promote sustainability in the community by encouraging people to bring in their broken things and we show them how to fix them free of charge. If possible we hope to return their items to functionality at the fair, or at least direct them as to where and how to get the item fixed rather than discarding it. Bad gym lighting and even worse gym sound also provided at no cost to you! Enjoy! In this video I get to show off my favorite timepieces, and give a little instruction about how you can set and regulate an antique pocket watch yourself. 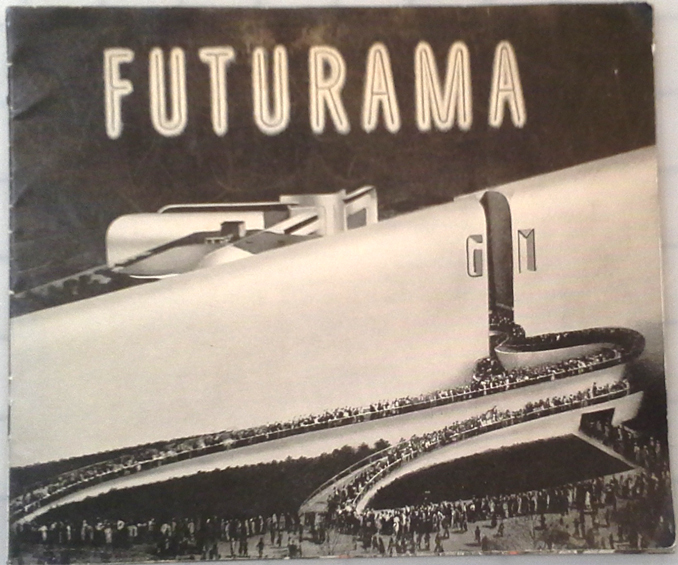 This wonderful artifact is a souvenir booklet printed in 1940 for the second year run of the famous 1939 New York World's Fair General Motors exhibit, Futurama. 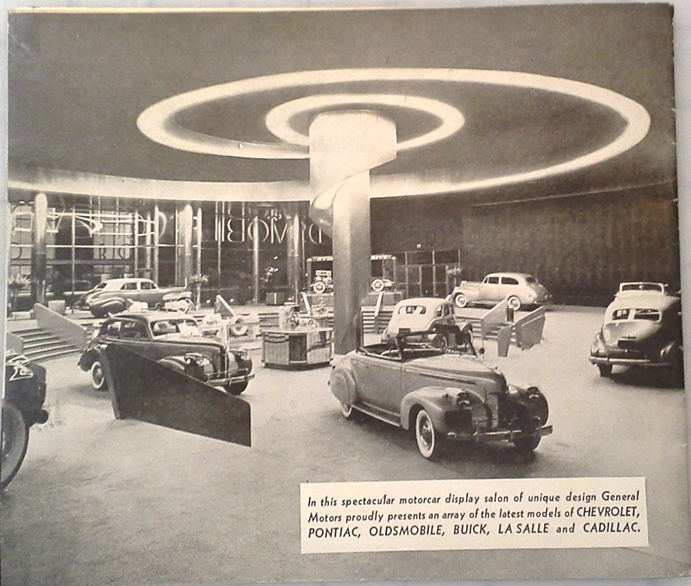 Inside the pavilion was a ride called "Highways and Horizons" which took visitors through an immense dynarama, showing the landscape of the future - the America of 1960 - which included a half a million buildings and thousands of scale miles of animated roadways. At the end of the ride each visitor was given a pin which simply read, "I Have Seen The Future". It is amazing to see this 75 years later, and to know in hindsight which of the projected visions of America became reality, and which were pure fantasy. ©1994-2015 Frantone Electronics All rights reserved.